What does an AP parent, who doesn’t like a pushchair, and has a child that hates it, do when out and about? Of course, baby wearing is one option â€“ definitely the best choice we made when Ameli was born, for both colic and for the calmest baby I could have asked for. 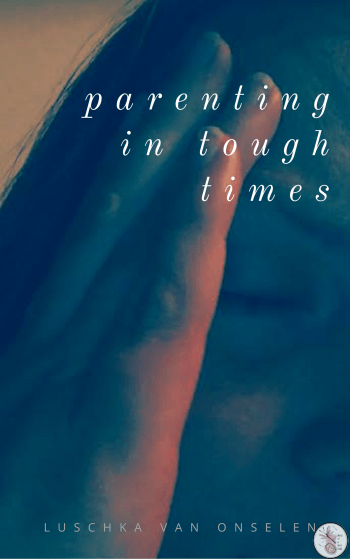 But, now I have a 19-month old who weighs almost 12kg and where I could carry Â her for up to six hours up to a few months ago, she isn’t so keen on that anymore either â€“ she likes to be able to walk, until she’s had enough, and in and out of the sling every five minutes is very fiddly. So, when we were offered a Smart Trike Recliner to try out, I thought, why not. And to be honest, I didn’t want to like it and had my suspicions that Ameli would react to it the same way she does to everything else that requires her to be strapped in â€“ with a howl. The box arrived and the Smart Trike Recliner required assembly, which was quite a process. It took about forty minutes and while the instructions for assembly are pretty good, I found the usage instructions to be a bit harder â€“ it’s hard to demonstrate â€œplace fingers here and pull on both sides simultaneously while pushing the seat forwardâ€ in one image, really. None the less, we assembled the Smart Trike and Ameli plonked herself down in the seat before it was even fully put together. Once assembled we took it for a ride around the neighbourhood and Ameli adores is. I did strap her in, but as I expected, that didn’t sit well and she squirmed out of the arm straps, but I’m not too worried as she’s snugly in the seat and the handlebars provide some protection. For younger children it also comes with a firm bar that holds them in place along with the saftey harness. While the sun visor is highly recommendable, especially for younger babies and in the summer, I had to take it off as I don’t like not being able to see Ameli, and more importantly, she squirms around and pulls at it because she can’t see me. There are three different foot rest options, which is really great. One ofÂ them is the pedals for the â€œbishishelâ€ as Ameli calls it â€“ that’s bicycle, if you don’t speak Ameli â€“ which she’s still a little small for, so there are two other foot rest options, depending on the position of the seat.Â The Smart Trike is easy to steer single-handed using the parent handle, although the child is able to control steering from the handlebars, so in crowded places two handed steering is advisable, otherwise you end up going all over the place. There are various seating positions, so a child can recline, which I found useful when Ameli fell asleep whilst out shopping â€“ just pop the seat back (once I’d figured out that whole ‘place fingers here and pull’ thing) and had one times happy toddler.Â And when she did wake, and did insist on being carried, I could steer the Smart Trike Recliner with one hand, and put the shopping basket on the seat.Â It does come with a â€˜basket’ but this is the weakest point of the Smart Trike in my view, as it takes no weight atÂ all and pops off really easily. There’s a little bag attached to the parent handle, big enough for a couple of nappies and some wet wipes, my phone and wallet, which is great as there’s no need to take additional bags with when you’re going for a walk, and there’s also a cupholder, perfectly sized for a bottle of water, or a standard take-away coffee size. So, from an AP perspective, as someone who never got on with a pushchair for daily use, I really like the SmartTrike. It gives me an opportunity to have my hands free, it’s easy to manoeuvre, Ameli can sleep in it if she wishes, and it is a fantastic starter bicycle with back support. I also like that you can use it from around 6 months to over three years, so there’s no need to constantly be buying top-ups. I don’t have to take it, and as sling or hipseat or anything else â€“ it’s a minimalistic way to go for a walk along the canal, and Ameli likes her â€œbishishleâ€, so I do too.Â The Smart Trike is also classed as a stroller and is fully stroller-certified, so can be used instead of one from six months of age – the only of it’s type in the world. Smart Trike are offering Diary of a First Child readers an opportunity to win a SmartTrike of your own. Â To be in with a chance to win, tell us how you would use the Smart Trike this summer? Walks along the canal? For icecream expeditions on the highstreet? Or perhaps for early morning strolls along the beach?Â We’d like to know how the Smart Trike Recliner would fit into your summer. The competition closes on June 13th at noon GMT, is open to UK addresses only, and a winner will be chosen at random using Random.org. 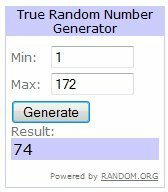 The winner is Emma L Clarke – thanks everyone for entering! I wish we had 100 to give away! Please take a moment to VOTE for us in the Inspirational Blogger category for the MADS Awards. It only takes a moment, and you can only vote once. Voting closes on 24 June. Thanks so much if you do! Smart Trike Recliner would fit perfectly into my summer as my 3 year old daughter is at nursery 3 days a week now so it will be the perfect mode of transport there and back for my 1 year old. He hates leaving his big sister so might help him to settle more quickly. Then when it’s just me and him during the day, we can take it on the short walk to the park to enjoy some fresh air and summer fun. I would absolutely love one of these for my 8 month old. I’ve wanted one since I first saw them but never quite managed it with my other children. I would use it every time we all go out together. Even at 8 months old, the baby wants to be part of his older brothers games and that just isn’t possible when they’re stuck in a buggy. With a smart trike he could ride along side them when they are on their bikes. I can just imagine the huge smile on his face the first time he went for a ride in it! I would use it on our holiday this summer. My son is at the stage where trying to get him in his buggy is a full on battle of wills. This will ensure our days out start with smiles rather than tears and tantrums. I would use the trike this summer- or more likely next- for little Roan to keep up with his big brother and sister on their bikes! As we planned to stop at 2 I gave the older 2 ‘s trike away! I would love this for my grandson, so I could take him with me when I walk my dog, he would love it!! It would be perfect for trips to the park, or strolls around the village. My boy gets bored in his pushchair so a Smart Trike would be a real novelty. We’ve waited so long for a grandchild, we want to enjoy everday. Winning a trike would be a bonus as we walk the dogs out on the stray! And to see our Macey’s sweet smile and her ever eager open arms and watch as she pedalled along would only add to her charms! Recently retired and with our darling grand daughter (Macey 1yr) visiting while mum is out working we need something light to help when we take the dogs for a walks and this would be ideal. Fingers crossed Macey would adore this!!! this would be great for taking my little girl out and about, she hates the buggy, so on this she would feel very grown up and we could leave the house without the tantrums in future. This will be perfect for when I take my little boy and my 5 year old blackberrying along the local canal this summer! I’d take my little nephew on days out at the park…and he will not try and run off as he would be having too much fun on the trike!! I could be super uncle as I know a little man who could ride this through the park! I can just imagine our little one on it when we go for a stroll in the park this summer. He loves ride ons. It would make a great present for my grandson for his first birthday, I bet he would make great use of it in the coming years. I’m just about to have my second baby and am desperately trying to avoid a double buggy. My 2 yr old Ben would love a smart trike to ride while I carry the new born in a sling! @Colette, Definitely think this and a sling would be better than a double buggy – and cheaper too! My little boy would finally be able to get behind the wheel of something! He’s always “driving” daddy’s car and pushing his own pram around…I think it’s time he got some real wheels! This looks amazing! Would love to use it when walking the dog along the canal. I might be able to manage both dog/toddler by myself with this instead of waiting for another adult lol! We have just moved to a new house surrounded by beautiful countryside and we are about to buy a dog so this would be perfect for my youngest son for all those long walks we are going to take. Also my eldest starts school in September and it is within walking distance so again my youngest could go on his trike when we walk his brother to school! It would genuinely be a Godsend. My daughter who is now 14 months refuses to sit in her pushchair. The trike would be ideal as we could wheel her around in it and when she wants to toddle around I can manage her and the trike with one hand. Twice a day we are out walking the dogs. We go around the cricket pitches and around the golf course.I can see my two little dogs trotting alongside my grandson. This would be a perfect prize. I have my niece and nephew coming to stay. My niece is 18 months and is into everything. With this we can take her long walks and when her little legs get tierd it means no one has to carry her, we will go walking in the woods, to the shops and she can even play with her teddies in the garden with it. And any more nieces nephews on the way will get all the use out of it. What a lovely prize. My 2 year old would love this, for school runs and trips to the park with his bigger brother and sister! He is very independant now, but sometimes needs to rest his legs! These smart trikes are getting more and more popular and look fabulous. I’m sure when my little boy is a little bigger he would really enjoy owning one. I’d use it for our short trips to town and the library & when we go to the river to feed his favourite ducks. @Maria Guzman, they really are, and we get comments every time we go out in ours! We would use this every day. So much better than the pushchair and more fun too! For the school run, to the park, to feed the ducks, the list is endless as this bike is so versatile. We wouldn’t need anything else. I love the smart trikes! Our friend borrowed us theres for a trip to the zoo last month and ive got to say it went down a storm with our little boy! So it would be great to have one of our own… We would definitely take him to the zoo again in it and also on walks around Chatsworth farm and by the river when we have a picnic…. it would be great just to nip to the shop too as our pram/buggy is so big that sometimes it can be hard work to take it everywhere with us. I love the bag on the handle… great for holding a nappy and some wipes for that emergency moment! I would use it when I take Piper to the canal to feed the ducks. We usually do a round trip of house to canal (for duck feeding):then onto the playground; then a walk around the estate (housing estate not my own country manor!) then back home. By the time we’ve satisfied the ducks and raced around the playground like loonies Piper is shattered – and so am I! We’ve tried taking her bike but her legs gave out about half way around and I ended up dragging the bike and carrying Piper! The smart trike would be fab because she would think she’s a big girl riding a bike but I’d have control and her legs wouldn’t get tired. The cup holder is a neat idea too because I’m always parched before we get home! A trip to the shops would be so much easier than the buggy or ‘can I walk’! Cruising out in the sun would be such fun. This would fit in to mine and my 17 month old daughters summer a treat! For me it would mean I no longer have to carry her in the carrier when I am taking the dog out (she’s getting rather heavy!) and for her it would mean that she has a shiny new Smart Trike! We have one that used to belong to my son, who’s now 5, but it’s looking rather “well worn” now (and it’s blue!) so it’d be lovely for her to have one of her own. Our 1 year old has Down’s Syndrome, although he is our joy & his older siblings adore him he is struggling with his physical development. This would make our family countryside walks more fun for him, keeping him safe & upright yet in a fun & exciting way. How lovely! This would be brilliant for our daily trip to our local duck pond, and would save me having to carry our little granddaughter back up the hills. A wriggling two year old is quite a handful for a Nana! Lovely handful though 🙂 Be great to take away to the caravan too, to practice handbreak turns around the field! I’d love this for my niece – she will love being pushed around by her mummy and daddy in this. This would fit into our routine perfectly as I walk my other daughter to school each day and the little one always complains about going in the pushchair as shes “big girl” now! This would make her feel gron up and yet safe at the same time. The Smart Trike would fit brilliantly into my summer as I have an (almost) six month old son who loves to sit up and watch the world go by. The openness of this would be brilliant for him and stop the tantrums when I try strapping him into his pushchair seat! This would be great to use for the school run instead of walking very slowly with LO and our girl! @Kelly, oh yeah! my hubby always insists on pushing when we go out together! It’s a gadgetty/man thing, I think! this would be fantastic for our holdays in cornwall this year!, would be great way for he to explore! To the park for a walk, the shops would be just a hop, to the seaside and the beach – with this all places would be within easy reach! Hello, I would like to use it for the summer festival where I am taking my daughter. It would save my back a bit as I have to keep bending to hold him up as hes starting to walk.The trike would keep him amused for ages. I would give it to my gorgeous Great Nephew George, his mum and dad are young car-less students, and any mode of transport will help them all get around this summer. The Smart Trike Recliner would give my little boy a feeling of independence and the chance to enjoy the sunshine. Lara (19 months) would love this! We live next to a canal and she’s just getting into calling the ducks and moorhens (which are all ‘Cockcocks’ at the moment!) and it would be so much easier to take this out than our bulky pushchair (I’m having spinal surgery this month so would love something like this rather than putting the pushchair up and down!!). @Kate Blakemore, Good luck with your surgery Kate! I hope it goes well – I do recommend these too, because they’re very light. Much lighter than a pushchair! I would take my little girl to the park, and it might make the shopping trips a little more interesting! If I were to win this I would use it everyday when walking the dog. Our current buggy is so big and hard to push, and our son loves everything car and bike wise!!! Walks to the park, walks by the river, walks round town and even walks round Tesco!!!! It would give our boy the chance to wear his leathers and cruise around town like the cool rider he is. Followed you on facebook and twitter would love to win this trike it’s so gorgeous!! My arms are too weak to carry my grand daughter so this would be perfect for the morning dog walking session and the afternoon school run. Ooh what a lovely wau to take my daughter out to the local fayres and car boot sales. This time of year we love to take the children out, give them a purse with a little spending money and they think its brilliant. This year I hope they have a smash the plates stand.. I love that one!! The smart trike recliner would be a really big help with all the country tracks which we normally try to advoid.Everywhere on walks, at the park, going to the shops, on the school run.Every day I walk around our village & this would be fun for my little Ewan, I would love to win this. How fantastic is that! The Wee One would be so chuffed with a set of wheels like those so he could cruise around burghley park chatting up the girls. All he would need is a pair of cool shades! Does it come with go faster stripes? This would ne great for us when we have our granddaughter this summer as her mum has started her nurse training. Make it lot easier when we take her out. Where we live there is a large lake close by, I would love a smart trike for my 22 month old Granddaughter so we could walk around the lake safe in the knowledge that she couldn’t fall in. I take my 2 year old daughter to the park everyday and this would be just perfect and so much fun for her. Plus, I also have newborn twins, so they would get use out of it once my daughter is too old for it- if she’ll share it! We are off camping for the first time this summer. As everyone is taking their bikes, my little boy is going to feel left out. A smart trike, would be a very SMART move indeed! My eldest son has a mini micro scooter but my youngest is too small for it.. this would mean they can both take something fun to the park! I would use the Smart Trike to take my little grandson out and about. We could go for longer walks in the nearby parkland, as I don’t think he would become tired and need to be carried. My husband and I are off to Center Parcs for a week in August and will be taking our 18 month old son with us. It will be our first holiday together with him. Before our son was born, my husband and I enjoyed active & adventurous holidays – with the Smart Trike I see no reason why that has to stop. The Smart Trike is so sturdy and easy to steer that we will still be able to make the most of Center Parc’s natural forest backdrops by taking long walks together and tacking across the lake. The handy recliner will mean that our son could take a nap while we enjoy the woodland scenery. Conversely, if he wants to be more active, he can use the starter bicycle. It just sounds so perfect. @Emma L Clarke, Congratulations on your win Emma! Let me know what colour you’d prefer and we’ll get it ordered for you! I hope you enjoy your holiday in August and get plenty of use out of your Smart Trike! This would be perfect for our strolls in the park. A trip to the park with my lovely neice!! my little boy would love this, we love going out in the countryside looking for flowers and feeding the ducks so this would be more fun than him stuck in his buggy!!! we’re going to france, so it’d be fun to push this around in the loire. are there lots of hills lol?? We have a National Trust family pass and a 17 month old who hates his buggy. With a smart trike i think he would enjoy it all a lot more! Feeding the ducks, walking the dog and school runs would be a bit less stressful too! I’d love this for a friend who has been having a bit of a hard time lately – would be great to get out in the country and clear the head! We’d use it to wheel our little boy down the dirt track which leads from our street to the local pub so mum & dad can have a couple of ice cold drinks in the beer garden! Wowser, this has to be the Godfather of all trikes – my little guy would look like a real Don, being carted around by his minions (mum & dad)! Love it! My youngest son is spending a couple of weeks with his grandparents this summer and this. It would take some of the strain off them, and be an altogether less tiring experience, if they had this to aid them on ‘outings’! Oooh – Attenborough Nature Reserve, Wollaton Park, Rufford Abbey, Newstead Abbey, The Johnson Arms beer garden – I’d take it everywhere! Thanks for the fab giveaway! The smart trike recliner would be a really big help with all the country tracks which we normally try to advoid. I’m trying to get fit, so with the Smart Trike Recliner I could go for long walks with my toddler. He gets fed up in his pushchair but can’t walk for too long without needing a carry. This would be perfect for us both! My son is just learning to ride his bike without stablisers so all of us can go out on the bikes together. My 2 Year old daughter would love this as she is disabled and can only walk short distances with a walking aid.It would give her a bit more independence. I’d use it for just walking to the shops and to the park in our village, hopefully if we get the chance to go away for a few days this year I’d take it with us and would use it for walks, I know my daughter would absolutely love it! 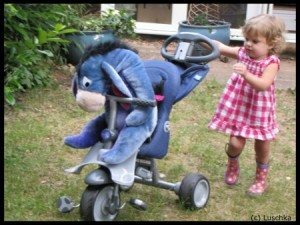 I would definitely use the Smart Trike Recliner for my little niece who enjoys regularly being taken out to my local country parks park on a regular basis and also when I take her on holiday this year, her little legs get tired after a short walk, it also looks easy enough to manouvre whilst holding the dogs leash too! We have a baby girl who is almost 4 months old and we are going on holiday at the end of august so if we were to win this we would take it away with us as it’s perfect for taking down the promenade or onto the beach. Even our 6 year old son could push our daughter around in this and he would love that as the pram is just a little too high for him. I would use it in the garden and at the many parks near us.It’s idea for when the little one get’s too tired to walk but fun enough for them not be stuck in a pushchair. I would use it for going on walks to the park, which is too far for little one to walk but close enough to not want to take the car or perhaps a trip to the shops. We often have a sunday afternoon stroll along the path of the canal where we live so it would be great for that and for all the other adventures we hope to get up to with our 20 month old son over the coming months. I have tweeted as @auroradreaming. Thanks for a great review. I’d love a Smart Trike Recliner and my 2 year old would play outside with it in our largish enclosed garden. I have visions of her following her older sister and cousins who’d be on their bikes on it! We’d also take it on our seaside holiday as we’d go along the promenade. 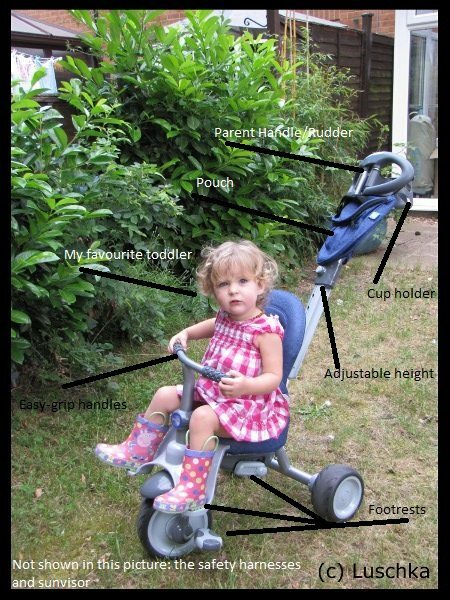 My little one refuses to travel in her buggy when doing the school run…..this would be a life saver! I would definitely love to take the SmartTrike for long country walks with my son – he would get a huge kick out of it! Our 2 year old son would love this instead of his boring push chair when we go out for the day! I would love to win this lovely product for my little rascal! We would take it everywhere with us. To the shops, on the beach and on holiday! My eldest starts school this year and my second is due to start pre-school at the same time! I would use the Smart Trike to get my second out of the pushchair so when baby three arrives (mid-July) no pushchair will be required! We would use it for walks around the lake and to feed the horses near to our house. My daughter would love one of these as she hates her buggy and would feel more grown up in a trike. She would feel as if she was in control not mummy! This weould be great for my DS. We live quite close to the beach but trying to carry the pushchair down onto the beach is difficult. I could take this onto the beach with us. I walk my oldest son to school and back and my youngest at the moment has got to go in a pram as he cant walk the full way, this would be great for him. how lovely! i would use this for my 18mth old, so he feels just like his big brothers and won’t have to go in the buggy. there’s a nature park near us, where all the kids can go on their bikes – it would be fab! I would use it to take my daughter out for walks around town and in the beautiful Hampshire countryside around us. She loves walking but tires quickly and is reluctant to sit in the buggy. I’m sure with this she’d be quite happy to have a sit down and rest her legs! Our Daughter is obsessed with boats so we would use the trike to take a sunny stroll down the Thames on a summers afternoon. I think it would be an excellent stepping stone between using the stroller and being able to go out on walks and bike rides. I live in a beautiful park of Scotland with lots of open places to explore. We like to walk along a nearby disused railway line and around a local dam. I think outside play is so very important for children. I try to give my daughter the opportunties to explore and experience things like being under dripping leaves, watching the swan’s nest and making a shleter. I would love to win this trike – it would open a new world of learning. We would use it to walk along the canal watching the wildlife. Thanks so much!!! Tweeted @TracyNixon and shared Tracy Nixon MSE!!! I love walking and take my children and our labrador dog out DAILY for walks- all year round. The only weather that stops us taking the stroller out is deep snow (when I cannot push it!!) Even when it rains – we still go out and splash in the puddles!!! Afterall, our labrador still needs to go out and the fresh air and exercise keeps us all healthy! We are lucky to live right on the Northumberland coast so lots of beaches to visit and beautiful countryside too. My parents also own a holiday cottage right on the beach over on the Isle of Arran, Scotland. We go over there on the ferry frequently and walk walk walk!!! Arran is a lovely little island full of country walks and bike routes. Lots to see to0 – from dear to wild goats and ponies…we see seagulls nests, highland cows, seals – all sorts!!! A beautiful place for picnics too!!! I think a smart trike is a great way of taking your child out to explore the world, without their little legs getting tired!!! I would love one as I only have a stroller, which is getting old now! If I win, this smart trike would be well loved, well used and well looked after!!! I would take this everywhere I possibly could with my little man. I relish every mimute that we spend together on my days off work and when the older ones are at school and we would be sure to have lots of giggles with this! I really want one of these for my 14 month old. We would use it every day, in every season! We have lots of parks near us so it would be great to take to the park or even to the local shops. We’re going to Devon for a week and it sounds like it *might* just fit in the car along with our suitcases! A great review and competition! I’d use the smart trike for walks into town or along the beach near our house. My eldest is getting a bike for his bday so Miss C could ride alongside him on the smart trike! We would use it for walks to the park, day trips and just going a walk up to the shops! Also i would love to take it on holiday instead of our pushchair as i am sure my wee boy would much prefer to sit in this!